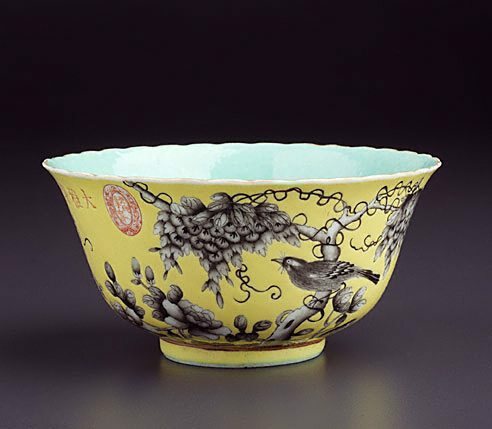 This bowl is part of a dinner service which carries the hallmark of a pavilion where the Empress Dowager once resided. The Asian Collections, AGNSW, 2003, pg.130. Porcelain decorated in this style was popular with the Empress Dowager Cixi and was probably made for her use during the reign of her nephew, the Guangxu Emperor. Hepburn Myrtle, 'Late Chinese Imperial Porcelain', AGNSW, 1980, cat.no 55. The Asian Collections Art Gallery of New South Wales , 'The Marvel of Porcelain', Sydney, 2003, 130 (colour illus. ).